Between Fulton & Hancock St. The Pines recently opened their backyard this spring, and it's gorgeous. The space is casual and laid back, but also charming with greenery and bistro-style tables. 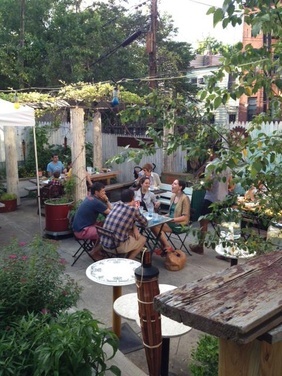 If you don't mind the summer heat, it's a great off-the-beaten-path Brooklyn spot to enjoy brunch. Don't forget: The Pines is cash only. Chef Angelo Romano is a flavor combining genius. Each dish is carefully constructed and plated-- no traditional brunch dishes here! The Cured Fluke with Green Tea Blini gets high points for creativity, and we also like the Duck Hash with Purple Potatoes, and the Pressed Pork Sandwich with kimchi kraut, jalapeño aioli, and potato salad. Just make sure to get a pie for dessert; they're from the nearby bakery Four & Twenty Blackbirds. Who needs a mimosa when you can have a Grimosa? The Pines uses grapefruit instead of orange juice in their version of the classic brunch drink. 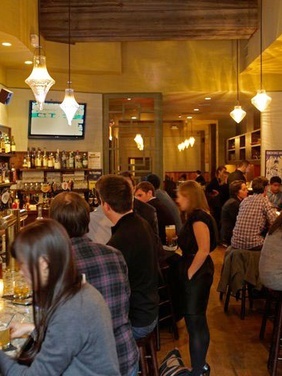 Rye House is a rustic gastropub with dim lighting (and cooling AC) for these hot summer days. We like the unique details of the interior, like the diamond-shaped, hanging light fixtures and marble bar seating. There's also a TV if you HAVE to watch a sports game. Come to Rye House hungry. The pub-y menu is full of hearty items like Biscuits & Gravy, Corned Beef Hash, and Huevos Benedict-- a spin on the classic eggs benedict with pico de gallo and chipotle hollandaise. If there's one thing Rye House is known for, it's their selection of artisan whiskies, bourbon, and beer. For a boozy start to the day, try "The Wakeup Call," a mix of jalapeño-infused Evan Williams Bourbon, lemon, honey, cinnamon and mint. Accepts brunch reservations for groups as small as two people.